I fell into this shop (it was down a step) startled by the upside down penguins on the ceiling! Double poppies in the garden. Seeds bought to Petersfield from my last home. Love them! Making collage cards for Tricot Too as well as the usual jewellery. This is the year my children bought me a trip to Amsterdam for my birthday. It was brilliant. Three days of wandering the streets, taking it all in. Amy, my middle child, came with me and that made it all the more special! I was a bit garden obsessed then. Growing food as well as flowers. Sadly, since the shop opened I rarely do any gardening. Plenty of pictures of flowers though in my collages which were also selling in Tricot. I did lots of small craft shows/ exhibitions but my mind was increasingly fixed on a shop. The blog was full of the pros and cons of having a shop of my own, especially since I now knew that Tricot Too was closing down and I would need to search for another job. Cats in cardigans anyone? Another Jenny Stacy product not made any more. I really wanted this pretty top in Tricot Too. It also came with pink roses. 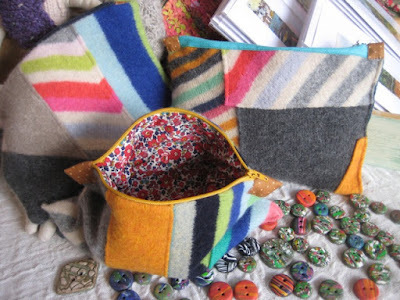 This blog should have been called the Tricot Too blog in 2009-2010 - so many pictures of their clothes and bits I'd made for that shop. I loved working there and lusted after many of the clothes. I couldn't afford anything but now I wish I had a few souvenirs of that time. I could have gone without food for a bit and bought this oh so pretty long knitwear roses top. Great over jeans. Couldn't I? This was the first Christmas I didn't do the Country Living show in a long time. I still visited but that made me sad. I'd got off the wheel and I never got back on again. Looking back (to celebrate 7 years of blogging) reminds me of what sells and what doesn't. I doubt I'll ever paint a face brooch again but I quite fancy doing a few cats in Liberty fabrics! A mention in Selvedge magazine! My buttons - going off to an exhibition in the USA! I love little things. The brooch was a 'Huggy girl' - I enjoyed painting those. Knitted hairbands for Tricot Too - I also made knitted necklaces and knitted bracelets for them that year. I enjoy looking back - it gives me ideas for now! For example I think why did I make all those felt flowers into necklaces and bracelets? They'd be so much better completely covering the front of a cushion. It also reminds me to make more buttons - I never seem to get round to making buttons nowadays and they do sell. Do we make things because we know they will sell or do we make things because we love to make? Both I guess. Often there isn't the time to experiment enough. And experimenting with a new idea is the most fun I think. For example, today I want to try out ideas for Christmas decorations. I have a picture in my head of an unusual handmade decoration but will it work? Can it be achieved in a two hour workshop and will people love making it? And (secondary) is a variation of it saleable? In 2009 there was a Textiles show at Petworth House (a National Trust property open to the public). It was good to have a stall there. I had run into the editor of Selvedge magazine at the Country Living magazine show and she said she'd like to feature my dolls. I never heard anything more and, being me, didn't push it. Ideas make way for other ideas. This week it's fairies - want to devise a quick way of making one for the top of the tree before next Thursday's workshop! An experimental bit of knitting. I'd like to make these happy jumping brooches again. In fact, with a bit of tweaking they could wear clothes too! It was a snowy winter and I made a lot of felt, and crocheted and knitted and enjoyed working at Tricot. Tricot Too used to have a sale in early January and lots of women eyed up the stock beforehand and then came in and bought when most things were half price or less! The sort of clothes that couldn't date because they were unusual. Some of the nicest presents you can imagine are made by Kate Box. She has just made three large size zipped bags which could be used as a pencil case, make up bag, sewing bits bag or just as a clutch bag for everyday essentials. 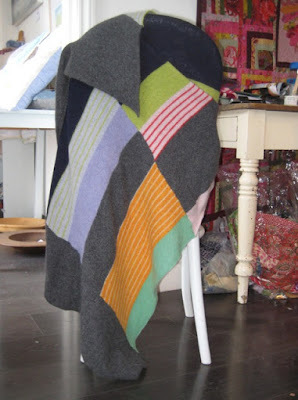 Kate makes the shop's very popular stripey wrist warmers and baby blankets. And now she's making an adult size blanket which is lovely to wrap round you as the evenings get cooler or just wear as a super-size scarf. Kate has just made two of these wraps - one with navy and one with grey. As many of our customers will agree - a brilliant Christmas present! Thank you to Carol Smith for taking these pictures for me as my camera charger is still hiding! Strawberry felt brooch by Jenny Stacy. One of Fortnum and Mason's Christmas windows showing a scene from Matthew Bourne's Swan Lake. Looking back, the most popular posts have been the ones about London. I also used to post weekly pictures of the clothes in the window of Tricot Too. They were very popular too.The clothes were unusual for their time and attracted a very individual following. I love making felt and used to make dozens of these strawberry brooches and felt flowers for jewellery. I remember getting Vogue as soon as it hit the newstands and tearing out any pictures that resonated with me. Anthropologie, had just opened in Regent Street and was/is highly innovative. Seeing how they recycle rubbish into art is always exciting. More pictures tomorrow in this week long walk down memory lane in celebration of 7 years of Handmade Happiness blogging! At a fair. A typical Jenny Stacy stall! Dollies and jewellery in an exhibition cabinet at Havant library. Selling outside in central Petersfield. With vegetables and flowers from my garden! Every week I'd picture my jewellery on the Tricot Too mannequins. Felt brooches by Jenny Stacy. I started working at Tricot Too early in 2008. I loved the clothes and the clothes inspired the jewellery. Since many of the clothes were grey I could be as colourful as I liked. The shop and sister shop Tricot Designs in Arundel, also sold my buttons and even, for a short time, my dolls. I also loved meeting and serving the customers. Handmade Happiness is across the street from where Tricot used to be and it's nice when those same customers come into my own shop. In 2008 I also did craft fairs as pictured.The best venues for selling are charity coffee mornings but there are much fewer of those than there used to be. 2008 was also a good year for the garden and many of the blog posts show pictures of garden flowers or vegetables from the garden. Not handmade but definitely happy! I still like this Jenny Stacy bracelet!! Looking back to the early days of this blog I remember how much making I did. Every day I made stuff especially in the three month run up to the big London shows. I also went to London regularly and took photos for the blog. I still go to London regularly but it's to spend time with baby grandaughter now. Family is pivotal but I have a rule not to put photos of them on the blog. The blog is about Handmade and Happiness as my kids remind me if I ever express a political opinion in a post. It's changed over the years. Now the shop is all important and recently, the shop's workshops. Readership peaked in 2012 and 2013 when I wrote a post every day. So I'll write more often. Commenting is problematic and it's a blogger problem, not mine. But lack of comments won't deter me from blogging regularly. Tomorrow I'll pick out photos from 2008. Cue Dr Who theme tune...! Get a shop - meet interesting people..